Exclusive: The Tea Party has been fueled by the idea that key Founders, like James Madison, opposed a strong central government and thus laws like “Obamacare” are unconstitutional. But Madison was the framer who devised the Commerce Clause upon which health-care and other reforms are based, notes Robert Parry. One has to hand it to the American Right. It has invested so heavily in its falsification of U.S. history – and in its propaganda machinery – that it can convince millions of Americans that up is down. A case in point is the notion that James Madison, “the father of the Constitution,” opposed a strong central government in favor of a system of states’ rights. The fact that Madison orchestrated American history’s greatest single shift of power into the hands of the central government and, conversely, away from the states, i.e. the U.S. Constitution, is transformed into its opposite by taking a few of Madison’s words out of context and ignoring what he actually did and why. So, the Right seizes on Madison’s efforts during the ratification of the Constitution to play down how radical a transformation he engineered, while ignoring his long record of decrying the Articles of Confederation for their weak central government. The Right also doesn’t mention Madison’s proud promotion of the Commerce Clause and other important federal powers. It is problematic indeed that Madison, the Right’s new Tea Party icon, was actually the key advocate of the Commerce Clause, which gave the federal government broad powers to regulate interstate commerce and has served as the basis for programs as diverse as Franklin Roosevelt’s New Deal, Dwight Eisenhower’s federal highway system and Barack Obama’s health-care reform. But the Right’s insistence that such programs are “unconstitutional” – and that Madison supposedly would agree with that argument – has proved useful in convincing many ill-informed Tea Partiers to dress up in Revolutionary War costumes and channel the Founders’ presumed hostility toward a strong federal government. Yet, the Right’s mangling of this history ignores such facts as Madison’s efforts under the Articles of Confederation, which governed the United States from 1777 to 1787, to get the states to relinquish control over national commerce to the federal government. For instance, Madison “sponsored a resolution instructing Virginia congressmen to vote to give the federal government the authority to regulate commerce for twenty-five years,” wrote Chris DeRose in Founding Rivals. Madison’s resolution won the support of Gen. George Washington, who was one of the fiercest critics of the weak central government under the Articles of Confederation because he had seen how the system of 13 “independent” states had left his soldiers starving and desperate, without supplies and pay, and nearly led to a mutiny by Continental Army officers marching on Congress in Philadelphia. When the Virginia legislature slashed Madison’s proposal from 25 years to 13 years, he voted against it as insufficient. His thoughts then turned to a more drastic scheme for consolidating power in the hands of the federal government, a constitutional convention. When that day arrived in spring 1787 – with a convention called in Philadelphia to amend the Articles of Confederation – Madison unveiled his radical alternative, not simply some modifications to the Articles but an entirely new system that wiped away the Articles’ language about the “independence” and “sovereignty” of the states. On May 29, 1787, the first day of substantive debate at the Constitutional Convention, a fellow Virginian, Edmund Randolph, presented Madison’s framework. Madison’s Commerce Clause was there from the start, except that instead of a 25-year grant of federal authority, the central government’s control of interstate commerce would be permanent. In other words, the Founders – at their most “originalist” moment – understood the value of the federal government taking action to negate the commercial advantages of other countries and to take steps for “pushing of [American] commerce.” The “ad libitum – &c &c” notation suggests that Randolph provided other examples off the top of his head. So, from the very start of the debate on a new Constitution, Madison and other key framers recognized that a legitimate role of the U.S. Congress was to ensure that the nation could match up against other countries economically and could address problems impeding the nation’s economic strength and welfare. Through the hot summer of 1787, the Convention delegates debated Madison’s plan, amid the give-and-take of compromise, generally reining in some of Madison’s most radical ideas. Contrary to the Right’s current propaganda, Madison actually favored even a more powerful central government than the Convention eventually adopted. Madison wanted Congress to have veto power over state laws, a provision that was dropped though federal statutes and treaties were made “the supreme law of the land” and thus federal courts could strike down state laws that were deemed in violation. Despite such concessions, the Constitution emerged from the secret meetings in Philadelphia as a stunning assertion of federal power – a reality not lost on some influential politicians who favored a continuation of the states’ “independence” and “sovereignty” that were explicitly recognized by the Articles of Confederation, but which disappeared in the Constitution. As resistance to Madison’s federal power-grab spread – and as states elected delegates to ratifying conventions – Madison feared that his constitutional masterwork would go down to defeat or be subjected to a second convention that might remove important federal powers like the Commerce Clause. So, Madison – along with Alexander Hamilton and John Jay – began a series of essays, called the Federalist Papers, designed to counter the fierce (though generally accurate) attacks by the Anti-Federalists against the broad assertion of federal power in the Constitution. Madison’s strategy was essentially to insist that the drastic changes contained in the Constitution were not all that drastic, an approach he took both as a delegate to the Virginia ratifying convention and in the Federalist Papers. To make the case that Madison was an opponent of a strong central government, today’s Right is fond of citing Federalist Paper No. 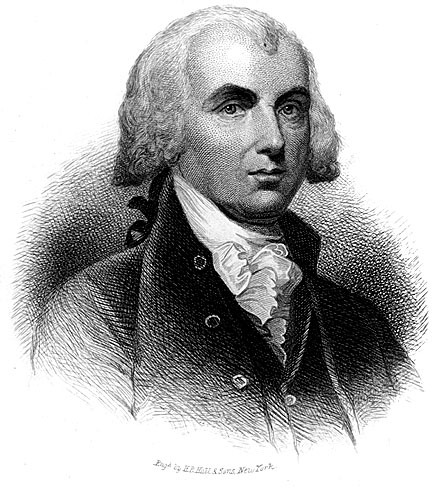 45, entitled “The Alleged Danger From the Powers of the Union to the State Governments Considered,” in which Madison used the pseudonym Publius. Madison wrote: “If the new Constitution be examined with accuracy, it will be found that the change which it proposes consists much less in the addition of NEW POWERS to the Union, than in the invigoration of its ORIGINAL POWERS. What the Right ignores, however, is the context of Madison’s comments as he sought to tamp down the fiery opposition to the Constitution. As a skilled politician, he was engaging in the age-old practice of finessing one’s opponent. After all, if Madison really thought the Articles only needed a few tweaks, why would he have insisted on throwing them out altogether? Plus, replacing toothless powers with ones with real teeth is not some inconsequential change. Under the Constitution, for instance, printing money became the exclusive purview of the federal government, not a minor change. And, stripping the states of their “sovereignty” and “independence” meant they would not be free to secede from the Union, a very important change that the South would challenge in the Civil War. Why the Right ignores this inconvenient truth should be obvious: it destroys the entire argument that Madison was a modern-day Tea Partier ahead of his time. To the Right, the Commerce Clause is the bête noire of the U.S. Constitution, yet here is Madison noting its broad support among Americans who didn’t have to go to a costume shop to buy their tri-corner hats. To cite Madison as an opponent of an activist federal government, the Right also must ignore Federalist Paper No. 14 in which Madison envisioned major construction projects under the powers granted by the Commerce Clause. “[T]he union will be daily facilitated by new improvements,” Madison wrote. “Roads will everywhere be shortened, and kept in better order; accommodations for travelers will be multiplied and meliorated; an interior navigation on our eastern side will be opened throughout, or nearly throughout the whole extent of the Thirteen States. What Madison is demonstrating in that essay is a core reality about the Founders – that, by and large, they were practical men seeking to build a strong and unified nation. They also viewed the Constitution as a flexible document designed to meet America’s ever-changing needs, not simply the challenges of the late 18th Century. But today’s Right will never accept facts and reason if they go against a desired propaganda theme. After all, the value in the Right having spent billions of dollars in building a vast media infrastructure is that the same bogus arguments can simply be repeated over and over. Indeed, that’s how many right-wing operatives earn a living. So, the real history gets discredited by calling it “liberal” or by repeating the same out-of-context quote again and again. But serious conservative scholars of the Constitution understand the document’s true purpose even if they sometimes disagree with a specific act of Congress. On Nov. 8, 2011, Silberman, an appointee of President Ronald Reagan, explained how the law – including its most controversial feature, the individual mandate requiring the purchase of health insurance coverage – fit with the Commerce Clause and prior legal precedents. “In other words, to ‘regulate’ can mean to require action, and nothing in the definition appears to limit that power only to those already active in relation to an interstate market. Nor was the term ‘commerce’ limited to only existingcommerce. There is therefore no textual support for appellants’ argument” that mandating the purchase of health insurance is unconstitutional. Silberman’s opinion also examined decades of Supreme Court precedents that affirmed the power of Congress to establish regulations over various national markets. So, even a very conservative legal scholar examining the Constitution and precedents could not find a convincing argument to overturn “Obamacare” – and that is because the Founders intentionally and broadly empowered Congress to address national economic problems through the Commerce Clause. In his later years as a political leader, Madison – like other framers of the Constitution – did switch sides in debates over the specific boundaries of appropriate federal power. For instance, Madison joined with Thomas Jefferson in opposing Hamilton’s national bank, but then as Jefferson’s secretary of state, Madison applied an expansive view of national authority in negotiating the Louisiana Purchase from France. Madison also shifted regarding the value of the national bank after his frustrating experiences as president during the War of 1812. But there should be no serious dispute over Madison’s greatest accomplishment, supplanting the states’ rights framework of the Articles of Confederation with the strong central government of the U.S. Constitution. And, as much as Madison is regarded as “the father of the Constitution,” he also deserves to be known as “the father of the Commerce Clause.” But don’t expect today’s Right to acknowledge the fact.